Several time series transformations including Box-Cox can be accessed in Excel using the XLSTAT add-on statistical software. where mt is the trend component and st the seasonal component, and εt is a N(0,1) white noise component. Note: there are many other possible transformations. 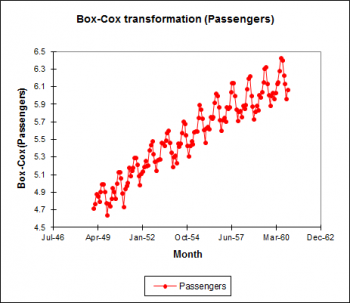 Some of them are available in the transformations tool of XLSTAT see the data transformation section. Linear filters may also be applied. Moving average smoothing methods which are linear filters are available in the Smoothing tool of XLSTAT.